“Where are you from?” people will often ask me at university. It is very hard to explain that I’m from one of the smallest cities in England, so I say I live roughly twenty minutes from Birmingham. And although I’m technically not in Birmingham, I have been there on days out most of my life. A lot of people associate Birmingham with being grotty and druggy. They are correct on the outskirts of it, but I argue you could say the same about a lot of places. The city centre, however, is beautifully vibrant. From the moment you hop off the train, you are surrounded by modernity and hustle-and-bustle. 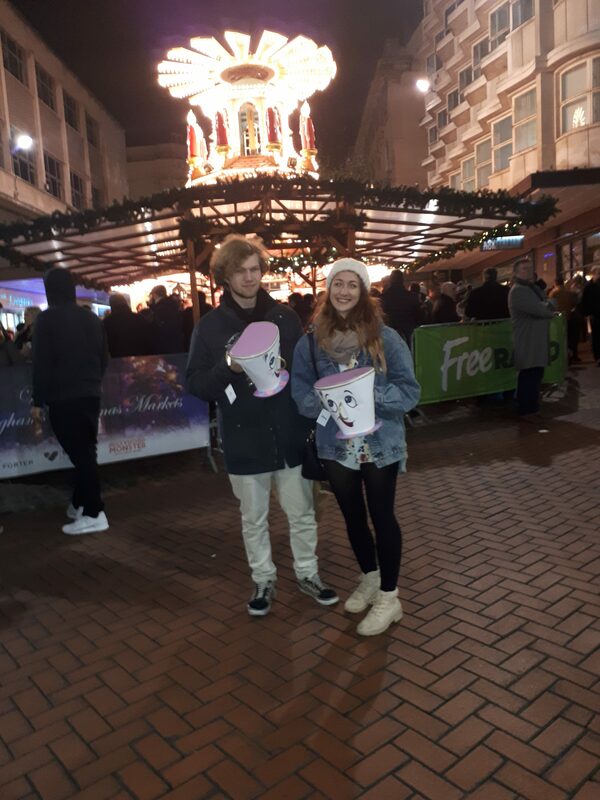 The German Christmas Market in Birmingham is a whole different scale from the one in Nottingham. It weaves all through the city centre, before reaching a grand finale in Victoria Square. At night it is especially beautiful, with the smoke from the frankfurts dancing up to the sky, the merriment from steins echoing down the street, and the lights twinkling as though they are stars. My boyfriend has been incredibly deprived of having this luxury every year, so I spontaneously dragged him on the train Friday afternoon to bask in it. Because it was Black Friday, the station was absolutely heaving with people. We wrestled our way through, before making it to the Bullring. I really wanted a fluffy coat from Missguided, but thought I would try in store before I bought with 50% Black Friday online. It was amazing, like wearing a hug. But unfortunately, when I got home it was out of stock online and has been since. Very tragic. Before we hit the market, we went to Primark. I was expecting it to be even worse than the train station, but luckily it was actually pretty quiet. As soon as I walked in though, I saw they had Chip backpacks for sale! I was in love, so naturally, we got two (one for me and one to sell on eBay, like the savvy students we are). The next day I wore it around Nottingham and got hella compliments, so if you’re looking for a statement bag you should definitely try and snag one of these. The German Market is both grand and quaint at the same time. All the stalls have cute intricate items you can buy, but there are a ton of stalls. Incense houses, Russian dolls, hand-painted mugs. Then the food… Was just a whole different level. Fish and chips that had the perfect coating of batter, steaming hot dogs absolutely packed with toppings, and of course mulled wine and steins a-plenty. There were even hot chocolates in little mugs, and you could get your money back if you gave away the mug. 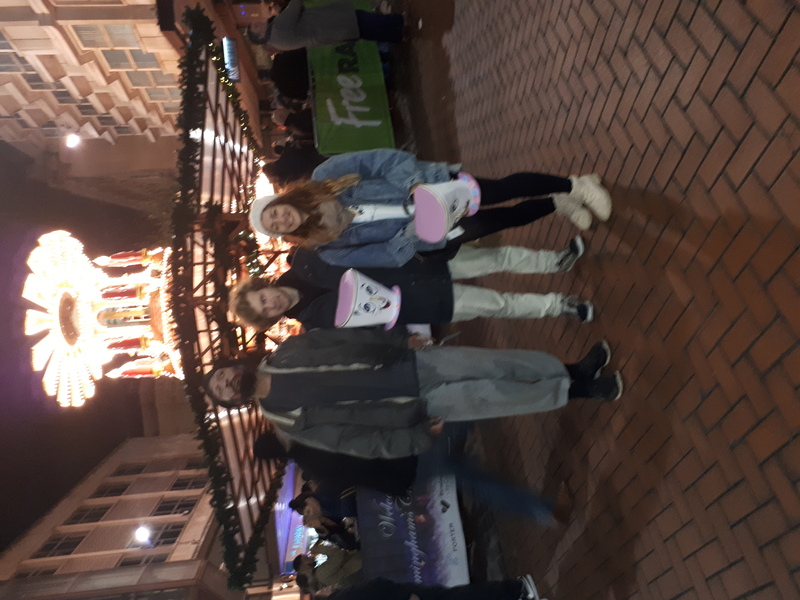 I get too emotionally attached to things and I’m saving money for presents, so I did not partake in the hot chocolate or the stalls sadly-overpriced food. Plus there was a severe lack of vegetarian options, so before we went we went to a cute pop-up in the train station called Not Dogs. They specialise in (you guessed it) vegetarian hot dogs, so we just had to give it a try. They were yummy, and the world definitely needs more veggie-orientated places like this. For dessert, we stopped off at Costa Coffee for a festive Honeycomb Latte whilst we waited for the train. What’s the Christmas market like in your town? Have you grabbed any goodies shopping recently? I’d love to know in the comments!